A Northland Catholic woman has good reason not to be surprised that St John Paul II had a close friendship with a married woman, Anna-Teresa Tymieniecka. Pope John Paul II and Wiga Wislocka share a moment in 1981. Wiga Wislocka-Autet, who is religious education programme coordinator in Northland, knew the thenCardinal Karol Wojtyla and met Mrs Tymieniecka during her days growing up in Poland. 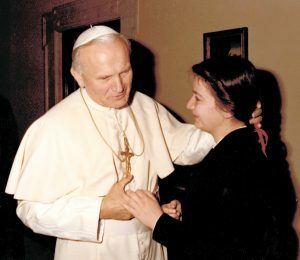 Mrs Wislocka-Autet’s family had a close association with Karol Wojtyla for many years, with her father being his personal physician before he was pope. A recent BBC documentary was based on more than 350 letters and notes from John Paul to Mrs Tymieniecka, spanning more than three decades, starting before his election as pope in 1978. The nature of the correspondence led journalist Edward Stourton to conclude that the pope and the Polish-born American philosopher Mrs Tymieniecka were “more than friends and less than lovers”. But Stourton acknowledged that there is no evidence that John Paul broke his promise of celibacy. “Indeed, everything in the letters suggests he kept it,” Stourton wrote in The Telegraph. The journalist posited that John Paul saw his close friendship with Mrs Tymieniecka, which developed after the two collaborated on a book, as providential. In 1996, Mrs Tymieniecka told papal biographers that she “never fell in love with the cardinal”. Mrs Tymieniecka’s husband, Hendrik (Henk) Houthakker, a Dutch-born professor of economics at Harvard University in the United States, was also close to the pope. The letters were sold by Mrs Tymienecka to the National Library of Poland in 2008. Mrs Wislocka-Autet told NZ Catholic she first met Mrs Tymieniecka in Poland. “She visited us at the last ‘Kajaki with Kardynal Wojtyla’ trip in summer, 1978, in Poland,” Mrs Wislocka-Autet said. This was just a few weeks before his election as pope. “Mrs Tymieniecka was just one of a number of persons [or] groups of people with whom Cardinal Wojtyla was very close,” Mrs Wislocka-Autet said. There were many “very close friendships” that developed over the years and these were nourished over John Paul’s lifetime, she continued. Many “valued and deep human relationships” developed between John Paul and his many close friends. Mrs Wislocka-Autet said this should come as no surprise. “He was a very charismatic and caring person, interested, in particular, in young people and their lives, willing to accompany them and assist as a pastor and a friend in their human and spiritual journeys. “He would spend time with individuals and their families — sometimes including members of four generations — participating and supporting them in their happy and/or hard times, life events and turns. Drawing everybody closer to God was at the heart of all John Paul did, Mrs Wislocka-Autet said, adding that this is the true meaning and purpose of “any relationship he had ever nurtured with others”. “All he did and wanted others to do was to live life in a close relationship with God; understanding, accepting and fulfilling God’s plan for each person. Mrs Tymieniecka was with John Paul the day before he died in 2005. Another close friend, Dr Wanda Poltawska, was with him on the day of his death. Asked by NZ Catholic for her opinion on the wisdom of clergy having close friendships with women, married or single, Mrs Wislocka-Autet pointed to the example of Our Lord. “Jesus had many women following him and he had developed (as far as we can say) pretty ‘close friendships’ with a number of them, breaking many customs and traditions of his own times…. The reason for this is to draw people closer to God, Mrs Wislocka-Autet said.